Design the outdoors in this contemporary extra long Sofa with Chaise Lounge and Chair Patio Set by CorLiving. Featured in our Textured Black Weave and accented with Dove Grey cushions this versatile set is perfect for all of your summer entertaining. Made with UV resistant resin rattan wicker, water repellent cushions and a durable steel frame this product is ready to withstand the elements of the outdoors. Transform the configuration to suit your needs. Enjoy your outdoor space with the Hampton Bay Megan Seagrass patio furniture set made with beautifully hand-woven wicker and durable steel furniture frames. The patio chairs and sofa boast deep, plush weather resistant cushions for ultimate comfort and longevity. The faux wood coffee table has a slat-top surface. Perfect for your porch, patio or sunroom, each patio furniture set includes two lounge chairs, one sofa, and one coffee table. Enjoy your outdoor space with the Hampton Bay Park Meadows patio furniture set made with beautifully hand-woven wicker and durable steel furniture frames. The patio chairs and sofa boast deep, plush weather resistant cushions for ultimate comfort and longevity. The coffee table has a wood woven top and handy bottom shelves for extra storage. Perfect for your porch, patio or sunroom, each patio furniture set includes two lounge chairs, one sofa and one coffee table. 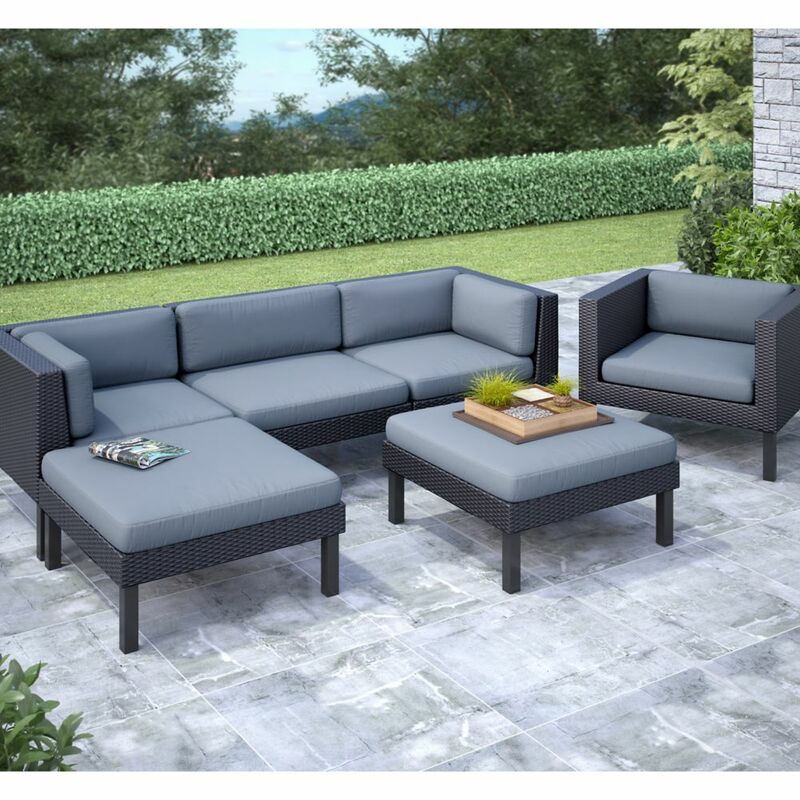 Oakland 6-Piece Patio Sofa with Chaise Lounge and Chair Set Design the outdoors in this contemporary extra long Sofa with Chaise Lounge and Chair Patio Set by CorLiving. Featured in our Textured Black Weave and accented with Dove Grey cushions this versatile set is perfect for all of your summer entertaining. Made with UV resistant resin rattan wicker, water repellent cushions and a durable steel frame this product is ready to withstand the elements of the outdoors. Transform the configuration to suit your needs.